This past September, the story of a deceased three-year-old Syrian boy who drowned in the Mediterranean Sea made international headlines after a Turkish journalist took photographs of his lifeless body washed ashore. The boy, Alan Kurdi, and his family were huddled together on a precarious inflatable boat headed for the Greek island of Koi, but the craft capsized just five minutes after leaving Bodrum in Turkey. The picture sparked outrage and solidarity among many people disgusted by how the Western world, namely Europe, was handling the burgeoning refugee crisis. It struck a particular nerve with the tenth richest man in Africa and third richest in Egypt, Naguib Sawiris, who has four children himself. So Naguib fashioned a solution that only a man with $3 billion could. He offered to buy an island in the Mediterranean and establish a habitable refuge that could provide shelter and jobs – an offer that has been roundly ignored by both Greek and Italian politicians. A Mediterranean island is probably on the shopping list for many billionaires – but when asked bluntly why Naguib was pursuing this somewhat outrageous scheme – he replied that he could not just take his money to the grave; he had to do something for his kids and his family name. Establishing a lasting legacy seems to be a common theme for Naguib, and is evident in his recent investments outside of where he and his family made their fortune. The Sawiris Family is worth an estimated ~$13.2 billion. The family patriarch, Onsi Sawiris, started a small construction firm in the 1950s, which he successfully cultivated into a massive commercial empire that includes interests in telecommunications, construction, fertilizers, cement, and real estate. In the late 1990s, Onsi passed on leadership of various these enterprises to his three sons: Naguib, Samih and Nassef. To hedge against inflation and ensure the Sawiris fortune will be passed onto the next generation, the family made a strategic decision to diversify its portfolio further and enter the mining and precious metals space. The chosen vehicle was Weather II, one of the many lucrative businesses managed by Naguib. In July 2012, it acquired its first company for ~$C500 million, Canadian based La Mancha Resources. Ironically enough, just one year later Naguib was blocked by the Canadian government in his bid to buy Allstream, at which time Naguib publicly stated he was finished doing business in Canada. 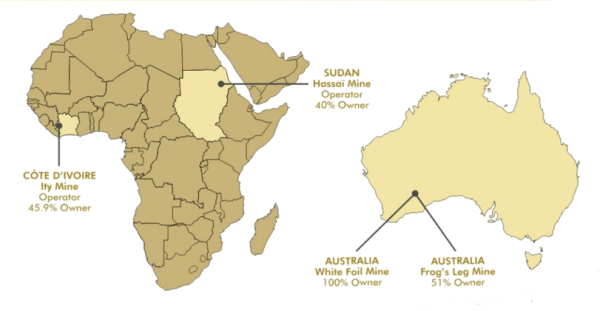 La Mancha was an international gold producer with production, development and exploration in Australia, Sudan, Côte d’Ivoire and Argentina, including interests in the Hassaï, Ity, Frog’s Leg and White Foil gold mines. The company was originally bought and privatized with the end-goal of restructuring and becoming a mid-tier producer, prior to re-listing as public company. Almost immediately, La Mancha’s transformation began. In 2013, the exploration budget was doubled to over $20 million with the goal of increasing reserves and resources; the remaining 49% of the Frog’s Leg Mine in Australia was acquired; and the PFS for both the VMS project in Sudan and Ity CIL project in Côte d’Ivoire was launched. 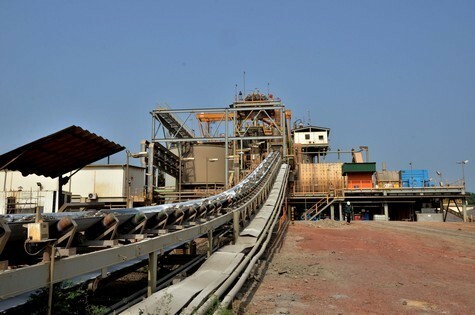 In 2014, La Mancha successfully consolidated its holdings and progressed further: the company increased its ownership in the Ity mine in Côte d’Ivoire from 45.9% to 55%, and commissioned its own Australian mill, allowing it to reopen the White Foil Mine in Australia – the fourth in its portfolio. Last year was a banner year for La Mancha. The company consummated three key deals that drastically altered its path. First, La Mancha sold its interest in the Hassaï Mine in Sudan for $100 million, allowing the company to exit from its riskiest jurisdiction and reduce its geopolitical overhang. However, it is the next two deals that proved to be so innovative that it transformed La Mancha from a simple mining company, with scattered assets around the world, into the streamlined private natural resource investment vehicle of the Sawiris Family. La Mancha’s first transformational deal was with Australian-based Evolution Mining. The deal saw La Mancha vend-in all of its Australian assets (Frog’s Leg and White Foil Mines, as well as the Mungari processing plant) and commit $78 million for a 31% interest. When La Mancha first acquired the Australian assets in 2012, it inherited 51% of Frog’s Leg that was dependent on a very expensive third-party mill, and a White Foil open-pit gold mine not in production because it lacked access to a mill altogether. Within three years, however, La Mancha was able to optimize its operations and expand its resource base. To begin with, it consolidated the ownership of Frog’s Leg though the acquisition of Alacer’s 49% for $165.7 million. This was followed-up with the construction of the Mungari Mill, a 1.5 mtpa facility that cost $110 million, which subsequently allowed for the re-start of White Foil. From 2012 to 2015, La Mancha’s production increased from 67 koz to 150 koz, while resources increased from 1.0 Moz to 2.7 Moz. Because of La Mancha’s assets and cash infusion, Evolution Mining is now the leading pure-Australian gold producer. La Mancha has been supportive of Evolution’s growth initiative, and through its cash infusion via private placement, Evolution was able to fund the acquisition of Barrick’s Cowal mine for $550 million. Evolution has increased its production guidance to 770-820 koz for fiscal year 2016, while reducing AISC guidance to $700-740 per ounce. Furthermore, Evolution is also one of few gold producers able to utilize its cash flow to fund early debt repayments, while returning value through its dividend policy. La Mancha currently owns 31% of Evolution with a base cost of ~90 cents AUD– almost a double in value in just a year. However, La Mancha maintains that it is a long-term strategic partner, even negotiating a two-year equity lock-up and two board seats subject to ownership requirements. With La Mancha on board, Evolution is poised to become the leading consolidator of Australia and Asia, and is even contemplating diversifying its focus to include other metals. We expect Evolution to maintain its impressive growth profile through both acquisitions and organic mediums. With its almost immediate success with Evolution, La Mancha looked to replicate its earlier vend-in strategy, but this time using its West African asset. In September 2015, La Mancha found its match in Canada-based Endeavour Mining – Naguib making his return to Canadian markets. Like the Evolution deal, La Mancha first optimized its vend-in asset to maximize its return. The company increased its ownership in the Ity Mine in Côte d’Ivoire from 45.9% to 55%, while negotiating a new technical agreement and mining convention with the government. The Ity Mine had been in production for over 20 years, but only had two years of reserves remaining. Within a timeframe of three years, La Mancha increased the resource at Ity from 0.7 Moz to 3.4 Moz and completed a positive PFS study on the Ity CIL expansion. Record production of ~80 koz was achieved in 2013-2014, but until now, the Ity mine has been processing its ore through a heap leap operation. That will change when the Ity CIL project breathes new life into the mine, extending the mine life by +10 years and increasing average annual production to 120 koz, at an AISC of less than $725 per ounce. With the overhaul at Ity complete, La Mancha was able to take a 30% ownership stake, or 177.1 million shares, in Endeavour Mining by vending-in Ity and contributing $63 million in cash. This valued the transaction at $77.9 million, giving La Mancha a cost basis of ~C$6.00 per share post-rollback. La Mancha has also been supportive of Endeavour’s growth initiatives, providing $75 million in-principle commitment to finance its growth projects, allowing La Mancha to potentially boost its stake in Endeavour. Endeavour Mining now has five mines and two development projects on the cusp of production. Production guidance has been increased from 517 koz in 2015 to 535-560 koz for 2016, while AISC have been decreased from $922 per ounce to $870-920 per ounce. Currently firing on all cylinders, and with La Mancha’s active involvement, Endeavor is a company that requires further inspection. Sébastien de Montessus – President/Director – Mr. de Montessus is a Director and the President of Endeavour Mining. He was previously the CEO of La Mancha, and under his leadership the company doubled its production, setting the course for the Evolution and Endeavour vend-in deals. In September 2015, Mr. de Montessus was appointed to the board of Evolution Mining. Mr. de Montessus previously served as a member of the Executive Board and Group Deputy CEO of AREVA and CEO of AREVA Mining. Neil Woodyer – CEO/Founder/Director – Mr. Woodyer brings over 30 years of experience in the natural resource space and is responsible for implementing Endeavour’s strategic growth plan and coordinating and directing the management team. He previously served as the CEO of Lloyds International Trading, a subsidiary of Lloyds Bank specializing in project and trade finance and commodity trading and of Amalgamated Metal Corporation’s group of New York and Latin America-based metal trading and mining finance companies. Michael E. Beckett – Chairman and Non-Executive Director – Mr. Beckett brings almost 40 years of experience in the mining sector and has been involved in the development of some of gold mines in Africa and Papua New Guinea; iron ore mines in West Australia; industrial minerals in the Ukraine, Russia and Indonesia; and platinum in South Africa. He is the former Chair of Ashanti Goldfields and served as the Managing Director of Consolidated Gold Fields. Frank Giustra – Non-Executive Director – Mr. Giustra is President and CEO of Fiore Financial Corp, a private firm managing a broad portfolio of private equity investments. He was the President and later Chairman and CEO of Yorkton Securities in the 1990s – he grew the firm into a leading natural resource investment bank. Mr. Giustra served as the Chairman of Endeavour Financial from 2001 to 2007, where he launched numerous successful resource companies, including Wheaton River Minerals (acquired by Goldcorp) and Silver Wheaton Corp. Mr. Giustra’s entrepreneurial successes also include the founding of Lionsgate Entertainment Corp, now one of the world’s largest independent film companies. Naguib Sawiris – Non-Executive Director – Mr. Sawiris is the Chairman of the Advisory Board of La Mancha, Chairman of the Board of Orascom TMT Investments, and Executive Chairman and CEO of Orascom Telecom Media and Technology Holding. The Sawiris Family have substantial interests in the telecom, construction and fertiliser, cement, real estate and hotel development industries and other businesses. Mr. Sawiris founded Orascom Telecom Holding and developed it into a leading regional telecom player until a merger with Vimpelcom created the world’s sixth largest mobile telecommunications provider. Agbaou is Endeavour’s newest mine, commissioned in late January 2014. 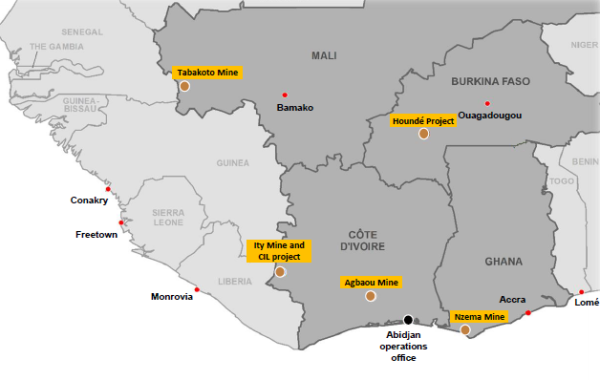 The company holds an 85% interest, while the State of Côte d’Ivoire holds 10%, and SODEMI (the state-owned mining company) holds the remaining 5%. The mine is located 200 kilometers north of Abidjan, and utilizes conventional open-pit mining. The ore is processed via gravity/CIL plant, which was built with a design capacity of 1.3 to 1.6 Mta. Production for 2016 is set for 165,000 to 175,000 ounces at a mine-level AISC cost of $650 to $700 per ounce. The M&I resource (inclusive of reserves) is 14.4 million tonnes at 2.54 g/t Au for 1.18 million ounces, plus an Inferred resource of 1.2 million tonnes at 1.71 g/t Au for 0.065 million ounces. The Proven and Probable reserves are 13.2 million tonnes at 2.42 g/t Au for 1.027 million ounces gold. Agbaou has exploration potential along the strike of its known mineralized trend. Tabakoto is located 360 kilometers west of Bamako in southwestern Mali, near the border with Senegal; it was acquired in 2012. Upon completing the acquisition, Endeavour initiated an optimization plan to turnaround the fledgling asset. 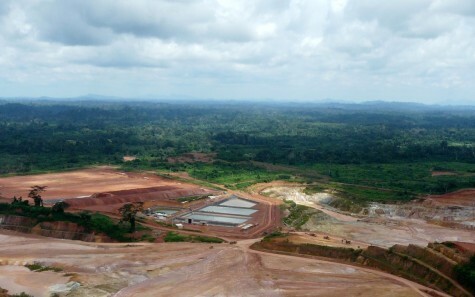 The Tabakoto and Segala open-pits were converted to underground opeartions in 2012 and 2015, respectively; meanwhile, the Kofi C open-pit was commissioned in 2015. The mill was also expanded from 2,000 tpd to 4,000 tpd to accommodate the ramp-up in production. Endeavour holds an 80% interest and the Malian government the other 20%. Production for 2016 is set for 155,000 to 175,000 ounces at a mine-level AISC cost of $920 to $970 per ounce. The M&I resource (inclusive of reserves) is 18.5 million tonnes at 3.09 g/t Au for 1.844 million ounces gold, plus an Inferred resource of 9.0 million tonnes at 3.55 g/t Au for 1.023 million ounces. The Proven and Probable reserves are 6.4 million tonnes at 3.5 g/t Au for 0.725 million ounces gold. The Kofi property is located to the northwest of the Tabakoto plant and Endeavour continues surface drilling to delineate additional resources and reserves. The Kofi B deposit was recently added to the reserves and production schedule for Tabakoto. Lastly, there is additional exploration potential on the northern part of Kofi that is analogous to Randgold’s Loulo property, which hosts an 11 million ounce resource. Ity is the oldest gold mine in Côte d’Ivoire, located 480 kilometers northwest of Abidjan. The gold was first discovered in the 1950s, and has produced over 1.2 Moz since production commenced in 1991. Like Endeavour’s other mines, Ity was optimized in 2013, and has since reached historic production levels. Endeavour gained majority ownership in 2014, and now holds a 55%, with Sodemi, the Government of Côte d’Ivoire, and a private investor respectively holding the other 30%, 10%, and 5%. Production is comprised by a mix of open-pit mining and heap leach ore treatment, and for 2016 is set to reach 65,000 to 75,000 ounces at a mine-level AISC cost of $800 to $850 per ounce. The M&I resource (inclusive of reserves) is 61.4 million tonnes at 1.57 g/t Au for 3.106 million ounces gold, plus an Inferred resource of 14.1 million tonnes at 1.52 g/t Au for 0.687 million ounces. The Proven and Probable reserves are 2.392 million tonnes at 2.39 g/t Au for 0.184 million ounces gold. The Ity CIL project is Ity’s expansion, which is projected to extend the life of mine by over 10 years with +120,000 koz per year at a projected mine-level AISC cost of less than $725 per ounce. Total upfront capital is $300 million and a DFS is currently underway and is expected to be completed by mid-2016. The Proven and Probable reserves are 27.967 million tonnes at 1.59 g/t Au for 1.429 million ounces gold. Nzema is located 280 kilometers west of Accra, the capital city of Ghana, on the southern end of the prolific Ashanti Gold Belt. The mine has been in production since April 2011, and utilizes open-pit mining and conventional gravity/CIL processing. Endeavour holds a 90% interest and the Government of Ghana holds the remaining 10%. Production for 2016 is set for 110,000 to 130,000 ounces at a mine-level AISC cost of $970 to $1,020 per ounce. The M&I resource (inclusive of reserves) is 34.6 million tonnes at 1.34 g/t Au for 1.49 million ounces gold, plus an Inferred resource of 5.9 million tonnes at 1.28 g/t Au for 0.244 million ounces. The Proven and Probable reserves are 4.7 million tonnes at 2.35 g/t Au for 0.356 million ounces gold. Houndé is fully permitted and is currently awaiting an investment decision, which is scheduled for H1 2016. Upfront capital is expected to be $325 million, and would provide Endeavour with 190 koz gold per year for over 10 years at an expected mine-level AISC cost of less than $720 per ounce. EDV owns 90% of the project with the Government holding the remaining 10%. The M&I resource (inclusive of reserves) is 37.9 million tonnes at 2.09 g/t Au for 2.551 million ounces gold, plus an Inferred resource of 3.2 million tonnes at 2.62 g/t Au for 0.274 million ounces. The Proven and Probable reserves are 30.6 million tonnes at 2.11 g/t Au for 2.075 million ounces gold. 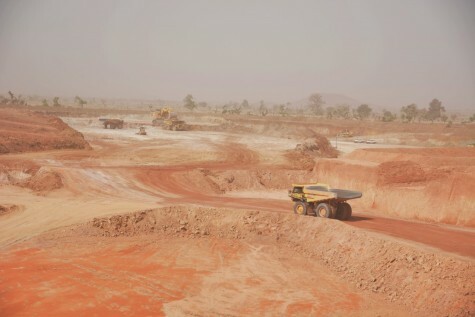 The robust grades and low cash cost make Houndé one of the highest quality development projects in West Africa. Karma was recently acquired through EDV’s acquisition of True Gold Mining. EDV now owns 90% of the project with the Government of Burkina Faso holding the remaining 10%. The mine is currently in construction is 95% complete, with first gold pour expected in early April of 2016. The mine will utilize open-pit mining and heap leach processing (4 Mtpa) and is expected to produce 110-120 koz per year at an AISC of $700 per ounce. The M&I resource (inclusive of reserves) is 75.2 million tonnes at 1.08 g/t Au for 2.6 million ounces gold, plus an Inferred resource of 65.2 million tonnes at 1.13 g/t Au for 2.4 million ounces. The Proven and Probable reserves are 33.2 million tonnes at 0.89 g/t Au for 0.949 million ounces gold. Karma also comes with significant exploration upside with 7 discoveries and 45 targets. In just one year, Endeavour paid down its debt burden from $316 million to $253 million, increased its cash position from $62 million to $110 million, and decreased its net debt from $254 million to $143 million. Before these adjustments, Endeavour’s net debt to 2015 EBITDA ratio was 1.8x, or right in line with its peers. After completing the pay down, the ratio decreased to 0.9x, and post True Gold acquisition, this ratio drops even further to 0.4x, propelling Endeavour to best in its class. 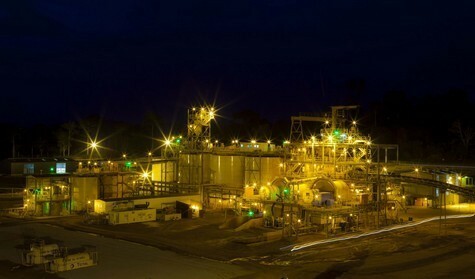 Endeavour finished the year with $110 million in cash, however, recently sold its Youga mine for $20 million and acquired True Gold Mining in an all-stock deal. The deal was valued at ~$140 million and was supported by La Mancha, which chose its right to retain its interest and acquire shares, injecting $61.5 million into the company. EDV also has access to an revolving credit facility capacity of $110 million, giving total available liquidity to approximately $301.5 million. Endeavour has set its exploration budget at $20 million, and has a non-sustaining capital budget of $48 million. 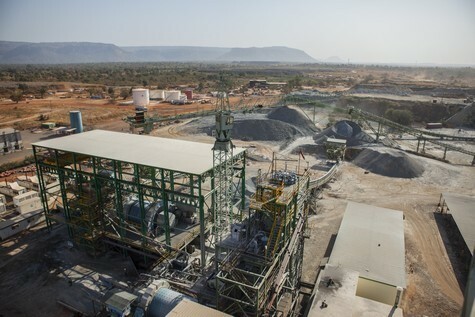 The major investment decision on the horizon is for Houndé, which should be determined sometime in H1 2016; if given the green light, Houndé will require $325 million in capital expenditures. Endeavour has more than enough cash to fund the construction of the mine internally; nonetheless, we believe the bulk of it will be financed by debt. Karma will also require some of capital, however, construction is almost complete and all that is left is $15 million, which can be easily covered by EDV. On the corporate front, Endeavour has done a good job streamlining corporate and G&A costs. From 2013 to 2015, total costs have decreased from $67.35 per ounce, to $46.42 per ounce, to $35.00 per ounce. The company also closed its Vancouver corporate office and relocated to Paris, which provides direct flights to EDV’s operations, and is located in the same time zone. Additionally, Endeavour closed an operations office in Accra and relocated it to Abidjan, closer to its operations in Côte d’Ivoire. Like many other gold producers, Endeavour Mining has seen rapid the rapid appreciation of its stock price due to the much waited rebound in gold prices. The good news is, there is still a lot of room left to grow. It is no secret that a lot of Endeavour’s value is derived from its pipeline of projects, namely Houndé and the Ity CIL expansion. 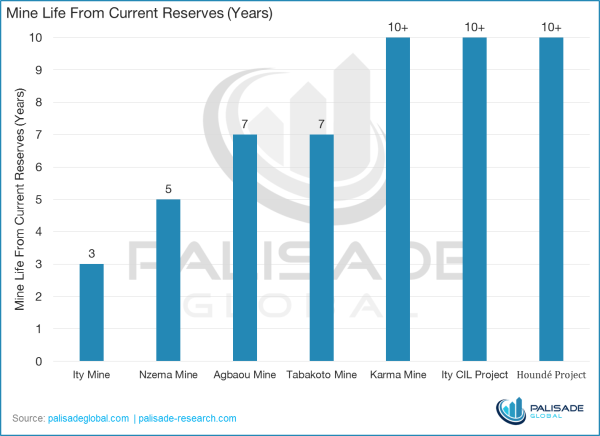 While EDV currently has a substantial and diversified production profile, the four mines currently in operation have an average life of mine of just 5.5 years, when newly acquired Karma comes on-line, this increases to 6.6 years. Constant resource replenishment will be required, and ensuring the new mines come online to replace the older mines will be essential to EDV’s valuation moving forward. In 2016, we see EDV shedding more dead weight in Nzema. Endeavour cannot seem to lower costs at the mine and with five years of mine life left, EDV would rather let a company that can squeeze every last ounce out of it takeover, much like what it with the sale of Youga. Our current one year target price for Endeavour Mining is C$15.30 or a 49.1% gain from its current price. 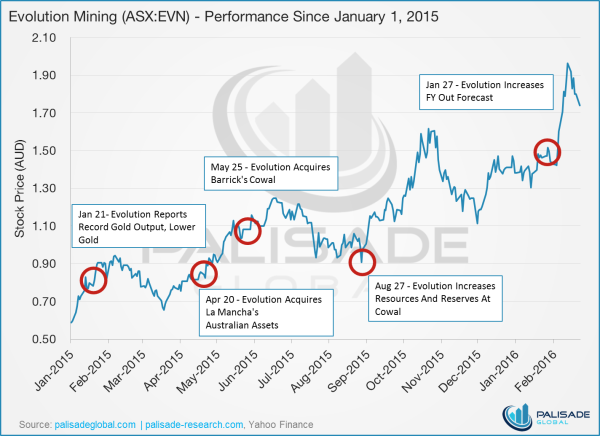 We highlight how leveraged Endeavour Mining is to the price of gold. For every $1 move in gold per ounce, Endeavour will increase by C$0.05. EDV is the safest amongst its peers In terms of operational risk as production is spread out over four mines with no mine accounting for more than 26% of the overall production. We would rate political risk as moderate because there are understandable risks of operating in developing countries, however, EDV are experts in the jurisdictions it is in, mitigating some of the existing political risk.